Erythrosis is a diffuse "reddening", mainly on the face (especially the cheeks), neck and bridge of the nose, often furrowed by dilated vessels that are often intertwined, called “telangiectasia”. This is a skin blemish caused by permanent dilation of the small surface vessels of the skin. This is the initial stage of a very common skin disease, rosacea, which occurs more frequently in women than in men, and preferentially develops in people who are predisposed to capillary fragility, emotional people and women during the menopause. With time, and without specific preventative treatments, it progresses gradually, with thickening of the skin and the formation of papules and pustules similar to those of acne. 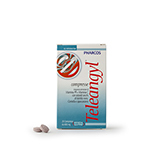 TELEANGYL is a vitamin PP and vitamin C dietary supplement with dry extracts of bilberry, centella and horse chestnut to overcome a lack of or increased need for these nutrients. 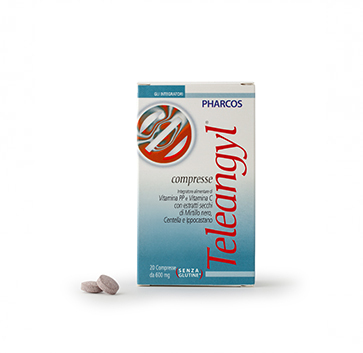 Bilberry, centella and horse chestnut help to improve microcirculation while vitamin C encourages the production of collagen for the normal functioning of the blood vessels. A gel that, thanks to its ingredients, provides an immediate sensation of relief and coolness (menthol); the application of the product promotes the well-being and tone of the skin (centella asiatica). Dermatologically tested. 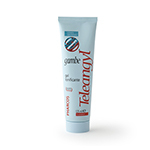 A protective emulsion with both physical (reflective) and chemical sun filters (UVA, UVB and IR) with extracts of mallow, horse-chestnut and other substances with a filmogenous and emollient action. Inorganic (skin-coloured) pigments serve to lightly “cover” any blemishes. Paraben-free. Dermatologically tested.